Take your travel for granted? Meet the people who can’t. Fliers wait to check their bags at Logan Airport. A Massachusetts native, Carl lives in the Boston area. He’s in his late 20s and affable, with a broad smile. He works in the legal industry in a fast-paced job that requires confidence and skill. And Carl is afraid to travel. It’s not just a fear of flying, though that’s how it began. Carl (he asked that his real name and identifying information not be used) hates cars. He abhors traffic. He can’t stand being on the T, and not for the usual reasons. 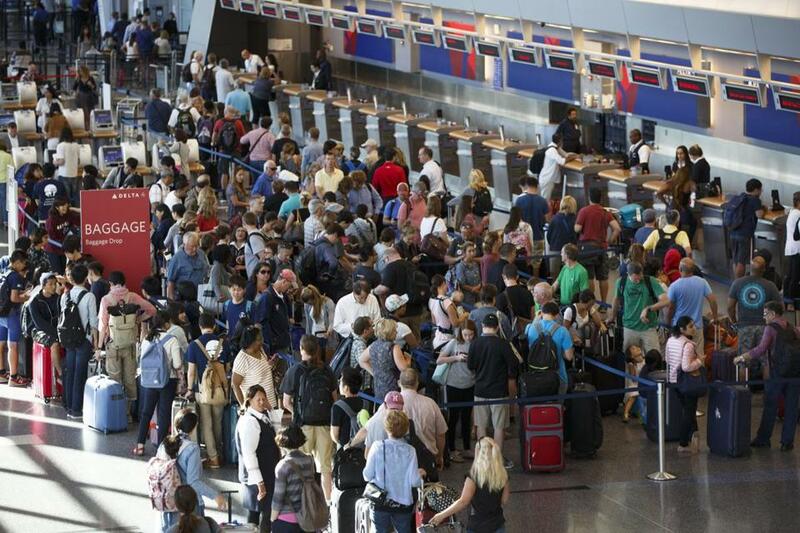 A surprising number of Americans avoid traveling. Eleven percent have never stepped foot aboard a plane, the industry association Airlines for America reports. Ever, in their lives. Even with passports now required for travel to Mexico and Canada, 59 percent of Americans don’t have one. When they do roam, many prefer the reassuring comforts of a chain hotel or restaurant or a familiar cruise-ship cabin where they can retreat from exotic ports of call. They’ll take a theme-park re-creation of another country over going to the real thing. She doesn’t have to tell Carl. He missed a close friend’s wedding because it was a five-hour drive away. He passed up good jobs because they were too distant, slowing the trajectory of his career. He never took vacations. For all the anxiety he has about traveling, Carl knows firsthand what he’s missing by not doing it. Fear of travel — it has the “Game of Thrones”-evoking name of “hodophobia” — is only one of the reasons people miss out on such things. Another is cost, of course. And time: Sixteen percent of American workers don’t get vacation days, the US Bureau of Labor Statistics reports, something else affluent frequent travelers likely take for granted. Even those who do get an average of only two weeks a year after five years on the job. More than half don’t even take all of those, according to the US Travel Association. If traveling has always been intimidating, there are also now toughened security restrictions, fears of terrorism, and viral videos of people being dragged off airplanes. Ditto unfamiliar customs and different languages. “Everyone is going to be uncomfortable in new situations where they don’t know how to behave,” Gorlin said. All of these things prove a challenge for the travel industry. A West Virginia native who was one of only a handful from her graduating high school class to leave the state for college, Tombaugh said, “I get it” that not everybody likes to stray from home. Carl has experienced that now, too. After seeking treatment to face his travel fears, he nervously got on a plane and flew to Europe. He said goodbye, packed up the car, and headed to New Hampshire in the weekend traffic.